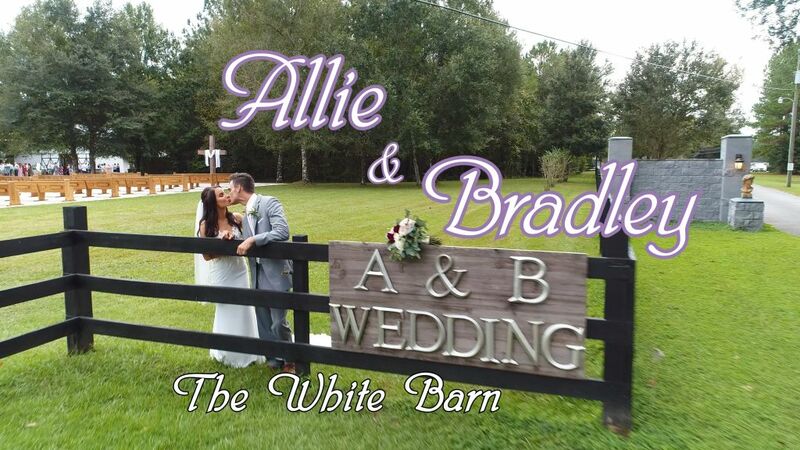 Wedding at The White Barn - Why You Need an Experienced Videographer - Celebrations of Tampa Bay | Wedding Photographers, Videographers and more! : Celebrations of Tampa Bay | Wedding Photographers, Videographers and more! 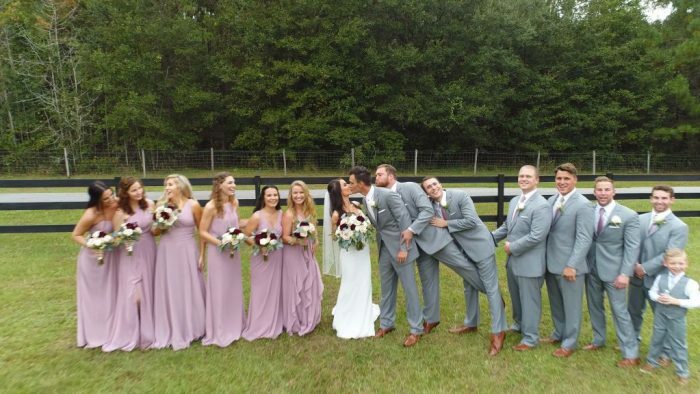 This wedding at The White Barn is a good example of why you need an experienced videographer who not only shoots with his eyes, but also with his ears, and who can move quick to capture those moments you just cannot re-create. My start time was only an hour before the ceremony which means that realistically I will only have 30 minutes for pre-ceremony shots because typically we have to be at ceremony site setting up multiple cameras, getting mics on officiant & groom, getting drone shots, and shooting guests. On this wedding the bride didn’t start to get dressed until 15 minutes before ceremony, which usually will elmiminate being able to get any shots of her in her dress before ceremony. 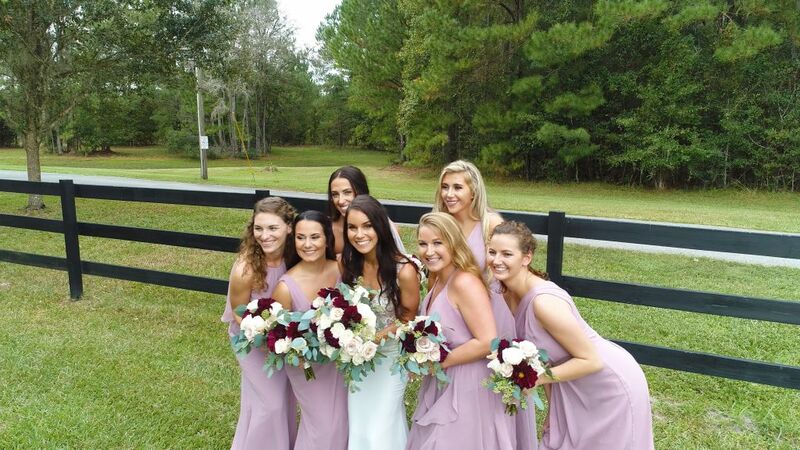 However being she was getting dressed at the location of ceremony was able to do the long process of setting up for ceremony as well as keeping an eye on both bride getting ready and groom getting ready simultaneously. I just happen to catch both the groom & the bride reading their letters to each other. This is an important moment to me because it captures real emotion and also because I often use that footage, as I did during this highlight video, to over lay some of their vows over. After the Groom was done, I went to check on the bride and she was already reading her letter. I also caught a moment before this that realized later during the toast by the best man, that was of significance. I noticed the groom before I was even dressed walking through the ceremony area. Later during the toast the Best Man talks about this moment and fortunately I had captured it, and had really a great shot with the cross in the background that gaved a visual to what the best man was referring to during the reception. Allie & Brad where introduced by one of Allie’s closest friends at a high school football game during their freshman year. They became closer friends during their junior year when they started working together at a local family entertainment park. When they started college they would go on study dates at Starbucks and eventually Brad asked Allie to be his girlfriend. 3 1/2 years later Brad asked her to marry him on their yearly family vacation in Michigan. 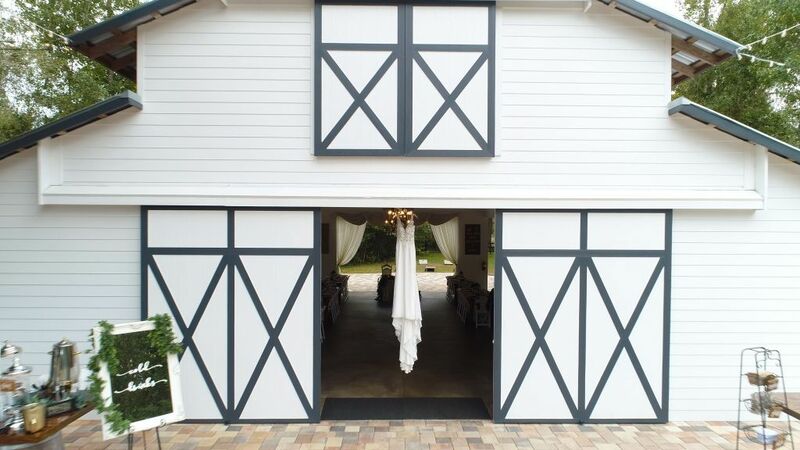 The White Barn is located about 45 minutes north of Tampa, close to the Pasco – Hernando County border. We have shot a few wedding with still photography at this beautiful venue so was excited to finally be able to shoot video here. 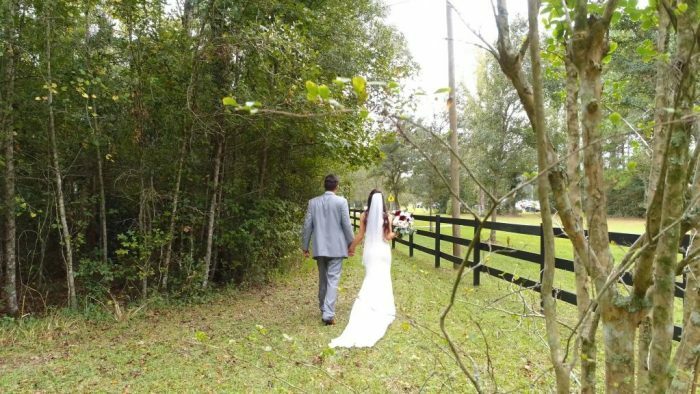 It is a very convenient venue with everything on property you need for great photography and video with a rustic background. Ideal for a Christian Wedding having a 15 foot cross at top of paved ceremony site with antique church pews. 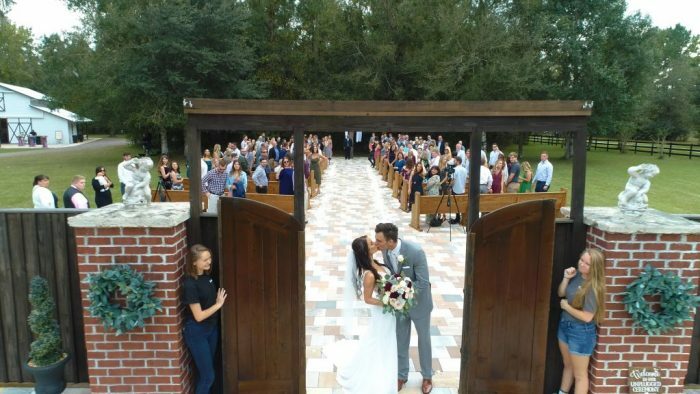 As you see on one of the opening drone shots, they have bride and grooms initials monogrammed on the country fence (0:37). 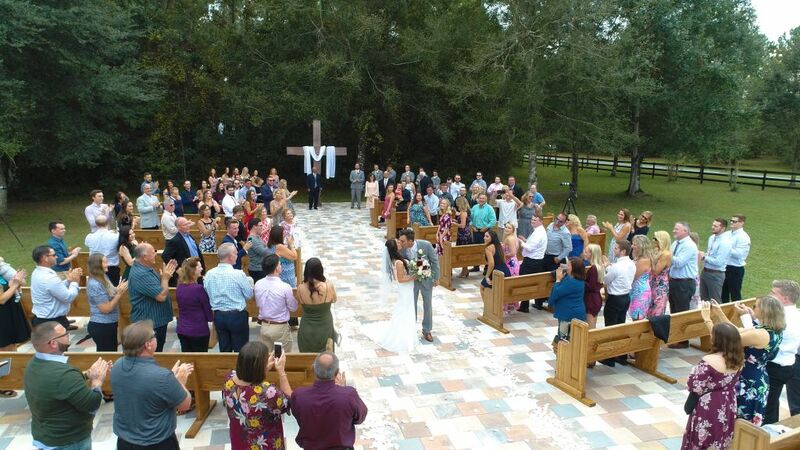 It made a great shot with the drone following the fence right into the bride and groom next to their initials. The actual barn is great being open area as you see the shot of the first dance with the natural greenery in the background (5:04). There will be more impressive shots like this when we post the regular highlight video. The staff is extremely nice, very family oriented, taking care of all the brides wishes. They as well as their DJ, Mike, do a great job of keeping everything on time, and communicating with all the vendors. For more of our videos in Hernando & Pasco County see our Hernando Pasco Video Gallery.